Police issued a fresh warning today about an armed robbery pattern that includes incidents this month in the Gold Coast, Old Town, and Lincoln Park. While four cases are listed in the community alert, a police source said the offenders are believed to be responsible for several other robberies, possibly including three that targeted DePaul University students early Thursday. CWB this morning first reported on cops' suspicion that a carjacking crew is responsible for a series of North Side armed robberies. This alert is linked to some of those hold-ups. • At 1 a.m. on January 13, two men jumped out of a stolen Suzuki SUV and robbed a woman at gunpoint outside of her Gold Coast home in the 1300 block of North Astor. Both men were armed with handguns as they took the woman’s backpack and fled eastbound. The SUV had been reported stolen earlier in the day. 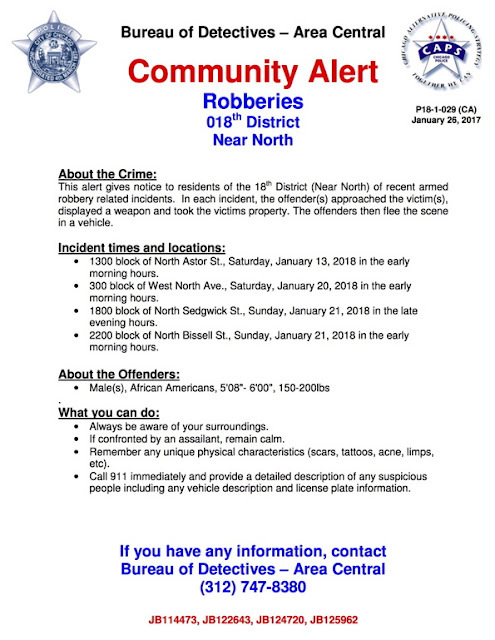 • Just after 2 a.m. on January 20, a 37-year-old man was walking in the 1600 block of North Orleans when three or four men exited a gold vehicle and approached him. At least one of the offenders pulled out a handgun as the others demanded his property, according to police. The crew took the man’s wallet and phone, then asked for the victim’s PIN. He gave them a fake one and they took off. • Just after 10:30 p.m. on January 21, two men emerged from an SUV and approached a man and a woman who were walking in the 1800 block of North Sedgwick. The robbers demanded the victims’ property while displaying a handgun, police said. The male victim, 26, handed over cash. As the robbers returned to their vehicle, one of them fired a single shot at the couple, but did not strike anyone. • The fourth incident happened early January 21 in the 2200 block of North Bissell, according to the alert. No further information was available about the case. Police described the offenders as black men who stand between 5’8” and 6-feet tall and weigh between 150 and 200 pounds. Anyone with information about the robberies is asked to call Area North detectives at (312) 747-8380. Subscribe for a year, donate a few bucks a month, or contribute an amount of your choosing. However you decide to support CWBChicago's operation, we thank you. Click here.